Portsea is a coastal holiday resort on the Mornington Peninsula, 62 km south of Melbourne. It is the most westerly of the continuous urban ribbon along the shoreline of Port Phillip Bay, and only the Point Nepean reserve lies to its west. Portsea also has a beach frontage to Bass Strait. James Ford was at first a producer of building lime from the local stone and later a local entrepreneur in Portsea. Ford arrived at Portsea in the early 1840s and is considered to have named the place after Portsea in Portsmouth, England (the historic dockyard where HMS Victory is at rest). He also built the first Portsea pier (c1860) and the first Portsea hotel (c1870) when other entrepreneurs were popularising Sorrento for tourists and sightseers. Ford's limestone cottage (c1870) is in Farnsworth Avenue. 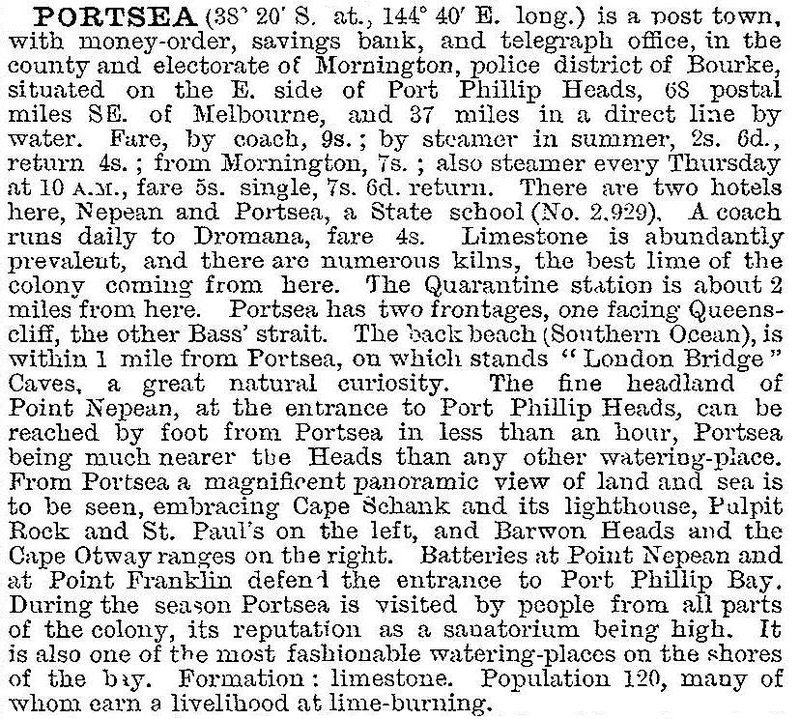 Portsea's reputation as a holiday place for Melbourne's well-to-do citizens probably began with Charles Gavan Duffy's choice of a site at Point King, where Portsea meets Sorrento, for his holiday house. It has commanding clifftop views of the bay, and clifftop sites have become the most sought after of Portsea addresses. That, however, was well into the future, after World War II. For most of the pre-war years Portsea's population was seldom more than 250 people, fewer than the number accommodated in quarantine and military installations at Point Nepean. The opulent forerunners of postwar Portsea were the Delgany mansion built for the Armytage family in 1927, the Portsea golf club (early 1920s) and the Portsea Hotel (1927). During the 1950s-60s postwar prosperity enabled the building of many holiday homes in Portsea. The Lord Mayor's children's camp, on the former Commonwealth defence reserve at Point Franklin, provided a convenient link with Melbourne's charity and society leaders, of whom many in turn had links with the Melbourne City Council and mayoral aspirants. Portsea became a haven for social climbers. A weekly journal Green Place (1972) styled itself as the Toorak magazine ... an Independent Voice and Guide to the Toorak Region and Sorrento-Portsea (1999). In 1991 some longer-term residents of Portsea observed that old families were dying out and new, more socially aggressive ones had moved in. Even more pessimistically, up to 20 years ago there was nowhere to eat, but now there was nowhere to park; and in 20 years Portsea would be like Frankston. That prediction looked unlikely when a year before a beach bathing box and the licence for the land on which it stood was sold for $50,000. When the record price of $185,000 for a bathing box on Fishermans Beach was realised in 1999, the prediction was utterly discredited. The median house price in Frankston was $105,000. Portsea has a generous backbeach reserve which is part of the Mornington Peninsula State Park. The reserve along Port Phillip Bay is less generous, and non-existent where wealthy holiday home owners claim title rights over the beach. There is also a recreation reserve with tennis courts. In 2014 the State government stymied the bid by trucking magnate Lindsay Fox to expand his property onto the public beach at Point King in Portsea. Portsea has a small shopping centre, a Catholic church, two hotels, a resort with serviced apartments, and ferry services for cars and passengers to Queenscliff. The Presbyterian church has closed and Portsea Camp is the name of the former Lord Mayor's children's camp. The median age of residents at the 2011 census was 65 years (Australia, 37 years). On census night 87.8% of dwellings were unoccupied (ie holiday houses).